Hopping Egg Vulcan, from the Japanese Manual. 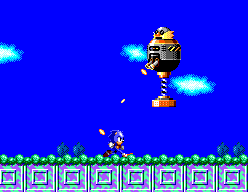 Throughout Sonic Chaos, and in a marked change of his tactics from other early games, our old friend Doctor Robotnik apparently thinks he's too important to face Sonic or Tails personally (until the last boss). Instead the Doctor deploys larger, tougher, nastier badniks as boss robots. 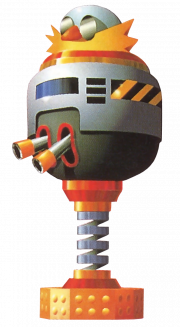 Sleeping Egg Zone's boss, referred to as Hopping Egg Vulcan (ホッピング・エッグバルカン) in Japan, is (in keeping with the pogo spring theme of the level) a bouncing, gun-toting, Eggman-look-a-like robot. This machine can actually provide some problems, as only the head is vulnerable, and the speed of its bouncing is such that landing a strike takes some work. All the while, the boss' Vulcan cannon spits bullets in Sonic or Tails's direction.